Foreclosure filings—default notices, scheduled auctions and bank repossessions—were down 18% in 2014 compared to the prior year, according to a report released today by Irvine, Calif.-based real estate data firm RealtyTrac. The 1.12 million properties with filings during 2014 represent a 61% drop from 2010, when foreclosure filings peaked at 2.87 million. 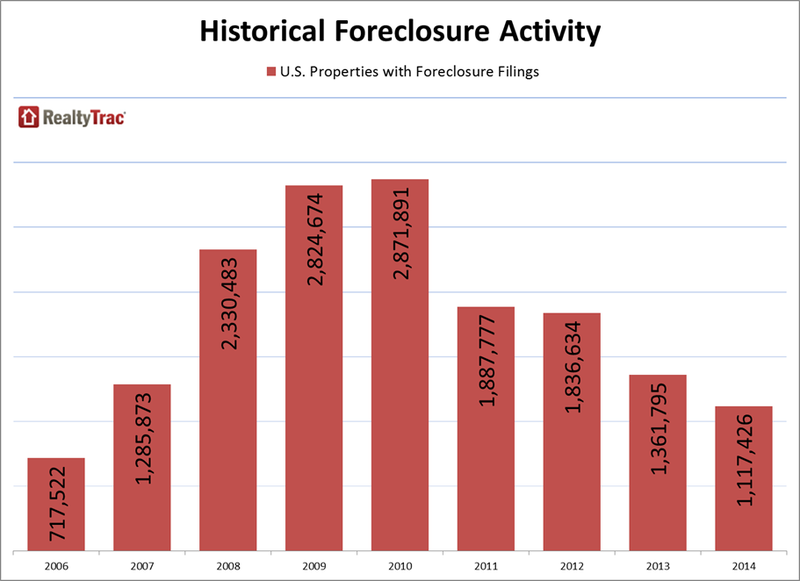 The 2014 figure was also the lowest number since 2006, when 717,522 properties in the U.S. had foreclosure filings. Last year one in 118 housing units, or 0.85%, had filings, marking the first time since 2006 that the annual foreclosure filing rate dropped below 1%.